This summer has been quite busy as we moved into our first real house. Our previous residence was a condo that we did own, but this is a real honest-to-goodness HOME. What are geeks to do when it comes to decorating? Go crazy with our favorite fandoms, naturally! 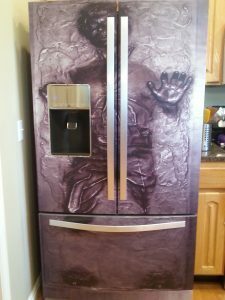 As with our Science Lab Theme Bathroom, the idea started when Eric wanted one item (In this case, the Han Solo in Carbonite fridge wrap) and I ran with it. 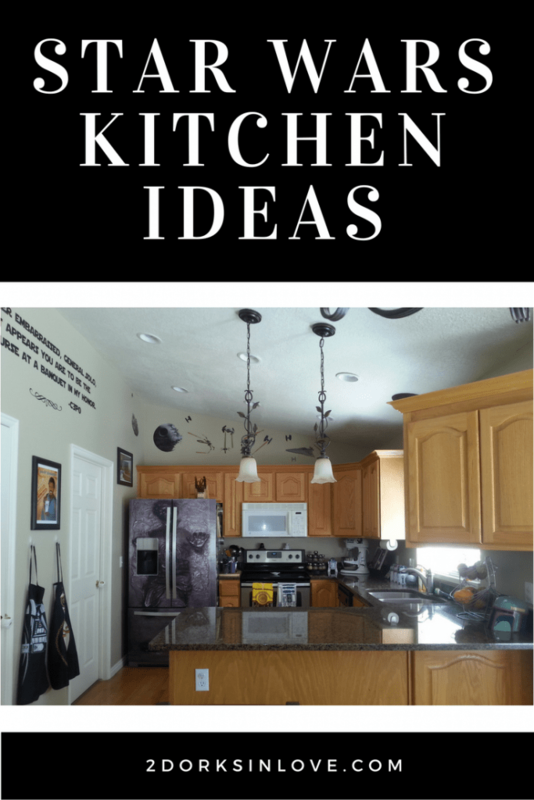 Here are some of my favorite Star Wars kitchen ideas that now live in our home. This site uses affiliate links. See my Disclosure policy for details. 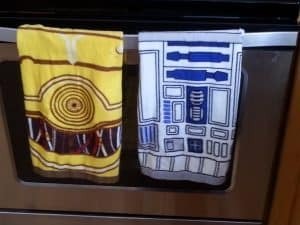 Adding a set of hand towels to your oven handle is an easy way to get some more geekery in. I was supposed to be done buying decorations (moving is expensive! ), but I had to have Amazon zip these on over when I saw them. If you want to make your own set of Star Wars kitchen towels (or any other fandom you like), get some solid colored ones from a store like IKEA. Buy 1/4 yard of fabric and sew a strip on. Tutorial coming soon! Hop on over to Amazon to get the C-3PO and R2-D2 Hand Towel Set. These aprons can act as cosplay and allow you to transform into your favorite character from the universe. These particular ones are not full length, but will definitely shield you from the messiness that can be cooking. I found ones where you could be Darth Vader, Slave Leia, Stormtrooper, Han Solo, Yoda, R2-D2, BB-8 and Boba Fett when I was shopping on Amazon for some of these accessories. 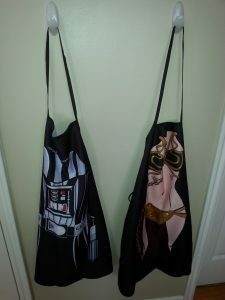 You can find these and other Star Wars aprons on Amazon. 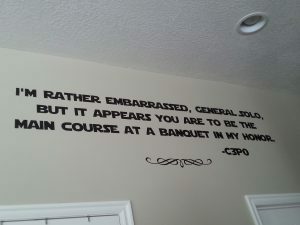 There aren’t so many food related Star Wars quotes, but this is a fun one. If you have a space that is large and high up, one easy way to decorate it is to do a big vinyl quote decal. 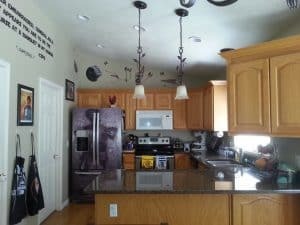 The previous owner had one from Thoreau up and I was going to keep it, but decided to take it down so I could go all out with my Star Wars kitchen ideas. We pondered over the different food related quotes and thought this one was fun. Since it’s a little bit more obscure, I had to have it made custom. I had been working with Word Factory Design on Etsy to make a Harry Potter quote for the Random Fandom room (details coming soon!) and asked her if she could make this. She was very helpful and prompt with shipping. Lots of fun geekery in her shop. 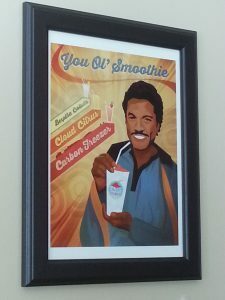 Lando Calrissian evidently is smooth in the kitchen too. This was one of the first purchases that I made on Etsy for this project. After all, when you come across something so whimsical and perfect for a kitchen, how can you say no? I love how the artist (Herofied on Etsy) did a word play and made it literally about smoothies. There are ‘Bespiña Cooler’, ‘Cloud Citrus’ and ‘Carbon Freezer’ (ha!) flavors. This is one of Eric’s favorite parts of our new decor. Herofied on Etsy has the You Ol’ Smoothie Print for sale, along with lots of other Star Wars goodness and geekery. I got this as a Christmas present last year. His body is made up of cups and the legs are the measuring spoons. You do have to be a bit careful when you reassemble it as some of the pieces are small and it can take a moment to get them to stay together enough to finish it. It could just be that I am a little clumsy? It’s so adorable sitting on the counter, though. You can find this R2-D2 Measuring Cup and Spoon Set on Amazon or Think Geek. Perhaps you find that you lean more towards the Dark Side and want that reflected in your kitchen choices. This measuring cup set will certainly fit the bill! As with the R2-D2 set above, the cups nest within each other to form the Death Star. I like having more than one set of measuring cups around when I cook so I don’t have to wash up until the end. Go forth to Amazon if you want your own Death Star Measuring Cup Set. She also offers them with a chestnut colored hood. So cute! This proved to be the most difficult item to find. Since a spoon rest for my stove top would help me while I was cooking, I tried looking on Etsy, but there was not much available. I even tried to find one that was just a star, but they were too cutesy for this setting. I finally happened upon this adorable little Tea-Wok tea tidy that can double for spoons, shipped all the way from the United Kingdom. 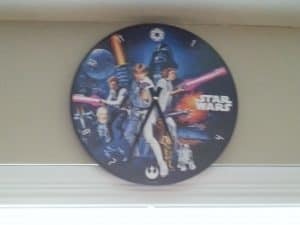 She has a few other Star Wars-related items, all hand-painted. I wanted one more item to spruce up the stove besides the spoon rest and hand towels. 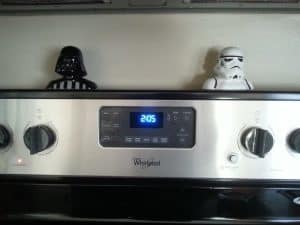 Now Darth Vader and a Stormtrooper watch over me ominously as I cook. I haven’t actually put salt and pepper in them yet; I suppose that would be helpful, eh? Now I will REALLY always know the time in there…. I suppose I didn’t NEED a wall clock since both the microwave and stove have clocks, but this was a great price for a wooden clock. The same company also makes one tailored towards The Force Awakens, but I kept it old school in my kitchen. Who do you think is winning this battle? There were originally intended for Ella’s room. It just looked so empty up there, so I nabbed them from her room and threw up this fight scene. I have plenty of other ones and can always buy more 🙂 ZZ noticed it the next morning and after staring thoughtfully for a minute, declared “That’s a broken moon.” That’s no moon…. 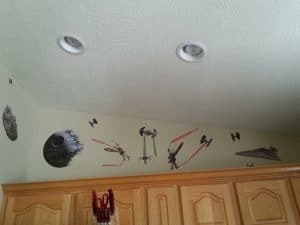 There is a wide variety of Star Wars wall decals available at Amazon. I found out about Kat Martin of Altered Landscapes from Salt Lake Comic Con. She takes thrift store paintings and geeks them up. 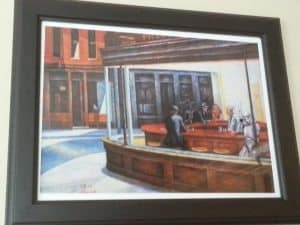 This was originally called “Nighthawks” by Edward Hopper. Kat added in Darth Vader and a Stormtrooper, calling it “Nightsiths”. We have several other paintings from her honoring Arrested Development, Legend of Zelda and Princess Bride that will go into the Random Fandom room. You have to see Nightsiths and the other cool geekery from katmartinartist on Etsy. Bounty hunters can be full of surprises. In this case, it’s cookies! I plan to be more domestic in this house and do some cooking. Look for some fun geeky recipes in the future! One of my favorite things to bake is cookies, so I wanted to have somewhere to store them. 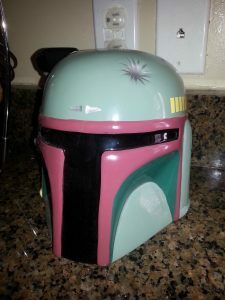 Boba Fett wasn’t in my kitchen yet, so I had to add him. This one from Amazon comes with a few packets of Star Wars cookies inside – bonus! For a while now, I have been coveting some of the geeky mixer decals that you can get on Etsy (which really is a magical and wondrous place! ), but I just hadn’t made the leap yet. When you’re setting out to decorate a whole kitchen, though, the mixer needed a facelift too. The original version by said “Come to the Dark Side….We Have Cake!” and Darth Vader was levitating a cupcake. I have always heard it as “We Have Cookies”, so asked if that could be done. I am so tickled by this and plan on using the mixer more in the future now. 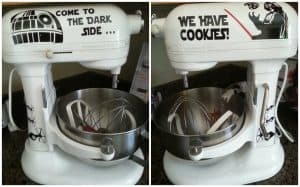 Deck out your mixer with the “Come to the Dark Side…We Have Cookies!” Vinyl Decals. Wookie cookies for the win! It’s a great time to be a geek as there are many different fandom cookbooks and otherwise geeky tomes. 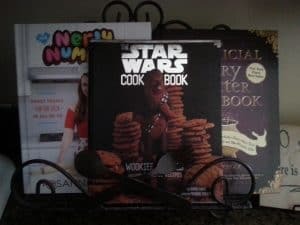 The Star Wars Cookbook is in front, of course. Behind I have Nerdy Nummies and The Unofficial Harry Potter Cookbook. I do hope to dip my toes into the world of cookbook writing someday. Look for Hyrulian Cooking on Amazon in the future! Add this Star Wars Cookbook and other geeky titles to your collection by heading to Amazon. R2-D2 and his friends chill on my counter. I used to have canisters to match my vegetable kitchen theme, but sold them when we were moving and I knew we were changing decor. 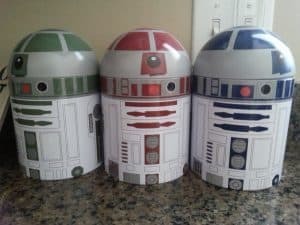 This cute little droid canister set is perfect for holding goods like sugar, coffee, tea bags or any other staples that you want out on the counter. Once again, Amazon is excellent for finding geeky items like the Droid Canister Set. This is likely one of the geekiest things I have ever done. 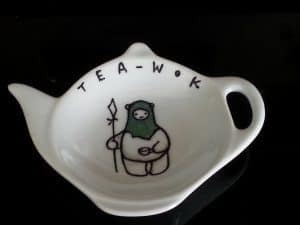 As I mentioned, this is the item that started it all and is the pinnacle of Star Wars kitchen ideas to me. Eric and I saw a picture of this online and dreamed that someday we could do that to our fridge. In our condo, the freezer part of the refrigerator conked out and we knew it would be a perfect time to make it happen when we moved into this house and bought a new one. 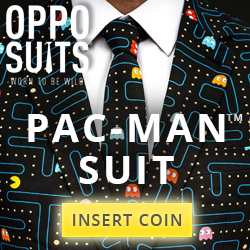 A Google search revealed that I could buy one from a place called RM Wraps. It took a bit of time to apply so that it could be done right, but was well worth it. 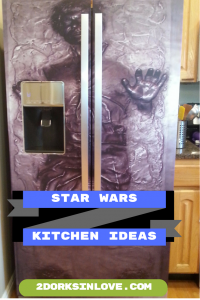 Do you have more Star Wars kitchen ideas? Which of these was your favorite? Do you have some other sort of geeky kitchen? Maybe if my kitchen was so nicely equipped, I would spend more time trying to cook something in there hahah ^^ Great post! I love this – the Lando print is the best! I want that lando print SO BADLY NOW. Love the Han Solo fridge! I am in love with you & your kitchen! I love Star Wars! 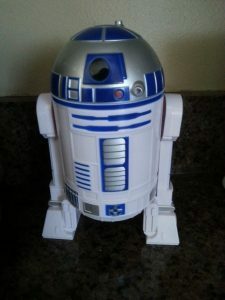 The R2-D2 measuring cup and spoon set and the Boba Fett cookie jar ares awesome! I just found this post because I got a cricut Air 2 for Christmas and am not finding very many geeky project ideas…from your Cricut post, I clicked over to this and am completely enamored with your commitment to the theme! I think the Lando print is my favorite! I have the death star measuring cups (they were in my Christmas stocking last year….I wonder how they got there? Haha), but the rest would probably be too over the top for my husband. Thanks for visiting. I am going to be doing a lot more geeky Cricut stuff soon. Yeah, I tend to go all out with a theme sometimes 🙂 I need to update our science lab bathroom post soon. 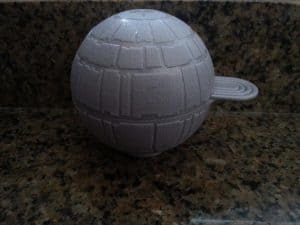 Maybe you could sneak in some small things here and there, like a dish towel (tutorial soon), a Death Star timer, or the like.